Johnna Darragh Ernst, PhD, is a distinguished professor of early childhood education at Heartland Community College in Normal, Illinois. She specializes in helping early childhood professionals connect with families to create inclusive early childhood classroom communities. 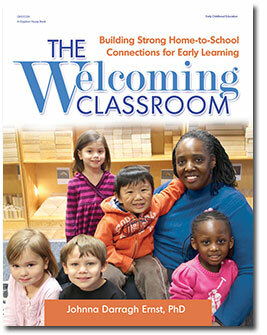 The Welcoming Classroom shows you how to create a welcoming atmosphere to encourage families to participate in their children’s learning community. The benefits of engaging families early will impact the young children in your care long after they leave your classroom! Age focus: 3–5.